Published by IMPRESS on the occasion of the exhibition ‘Forget Us Not...’ at the Hardware Gallery, London (September 1995). 2 Artist’s Books bound together within a gatefold sleeve as a response to the social, cultural and religious differences experienced during a visit to the neighbouring and historically linked countries of Armenia and Iran. Edition of 250 with 16 full colour off-set litho reproductions plus a 4pp black & white insert, “I’m sure we’ve met somewhere before?”. Translations by Karen Babayan. Artists’ book published 1997 by the Wild Pansy Press on the occasion of the exhibition Kookoo at the Hardware Gallery, London (September 1997). ‘Recollections of a Glowing Plum’ or ‘Growing Pains’ - a humorous reflection on pregnancy and post-natal thoughts. Edition of 50 with 7 original linoleum cut prints and letterpress text. 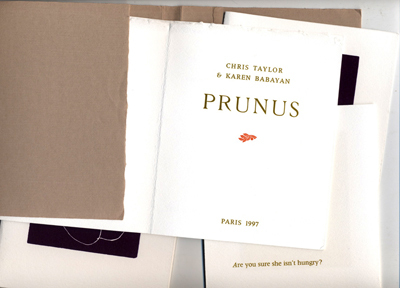 Printed by Michael Caine and Chris Taylor at Atelier Cerisaie, Paris. 16 x 13.5cm, 24pp loose bound in a printed dust jacket.